Will Dickinson was facing a conundrum. He wanted to study sheets of graphene and he had some of the world's most sensitive lab instruments at his disposal. His problem was this: Graphene sheets are, by everyday standards, teeny things; a large one is just a few microns in diameter. His go-to instrument for material analysis is the atomic force microscope (AFM). But AFM work is slow and expensive and Dickinson needed to examine a whole lot of sheets. So Dickinson, a Ph.D. student working with Hannes Schniepp in William & Mary's Department of Applied Science, came up with an ingenious technique to examine graphene sheets quickly and inexpensively. Schniepp, the Adina Allen Term Distinguished Associate Professor, says the lab's discovery is a big step toward mass production of consumer-grade graphene products. Their investigation was funded by the National Science Foundation. The new technique is outlined in "High-throughput optical thickness and size characterization of 2-D materials," published with collaborators from the University of Connecticut in the Royal Society of Chemistry journal Nanoscale. Graphene, Schniepp explained, has a virtually limitless potential as a material of the future. Like diamond, graphene is an allotrope of carbon. He ticked off a few of the virtues of the carbon allotrope. "It's the strongest material on the planet. It's one of the stiffest materials. 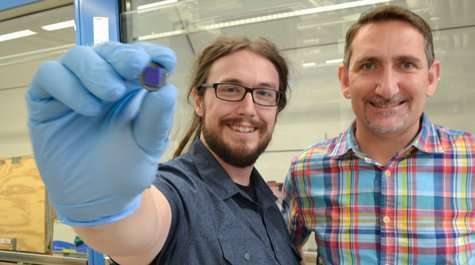 It has amazing electrical conductivity," he said. Schniepp added that the raw material of graphene is graphite, "which is literally dirt cheap." Scientists have been making sheets of graphene a single atom thick, but assembling enough tiny, nanoscale graphene sheets to make an airplane fuselage—or even a semiconductor—poses some challenges. "From these really small sheets, to get to a TV, or a solar cell, or a bike—well, you need a lot of sheets," Schniepp said. "So, first of all you need to come up with a technique for producing a lot of them. We're making progress with that." Indeed, graphene is beginning to find its way into consumer products—Dickinson has a pair of headphones with graphene membranes and Schniepp says that larger products, such as tennis racquet frames, are about five years away from hitting the market. One of the necessary aspects to mass production of graphene is quality control. That's where Schniepp and Dickinson's contribution will help. You make graphene by dispersing your raw material in a strong ultrasound bath then depositing it on a substrate. The sheets of graphene produced can be a single layer thick—or more. And the number of layers matters, Schniepp said. "The properties of these sheets are all different," he said. "If you go from one to two, there's quite a difference in the properties of the sheets." Schniepp and Dickinson needed a high-throughput way to examine the thickness of the sheets. Electron microscopes can do the job, but the production of graphene on anything approaching an industrial scale is going to require analysis that is relatively quick and ideally does not require multimillion dollar instruments. They decided to try optical microscopy, using a decent-quality microscope, "One that you would find in almost every research lab—or even teaching lab—here at William & Mary," Schniepp said. Optical scopes have minimal use in nanotechnology applications, which require higher resolution. "When you talk about graphene, because the sheets are so incredibly thin, they give almost no optical contrast. Light goes entirely through them. So, if you just look at them through a microscope, there is almost no contrast," Schniepp explained. Dickinson was frustrated with trying to look at large graphene sheets using atomic force microscopy. AFM works with objects that are, at most, about 100 microns on a side, and the samples he had were several times that big. "So, I was thinking, I can't use the AFM. Maybe I can look at them with the optical microscope, and get something out of it," Dickinson said. "I need something," he thought to himself. "Because having nothing right now is not making anyone happy." He put some graphene sheets under the optical 'scope lens and saw what a large number of engineers and scientists had seen before: "You could see the different layers, but the image just isn't good enough." Dickinson began to tinker with the process, refining it step-by-step. For instance, he made an image of the bare substrate the graphene sits on. Then he could work on a way to subtract that background. "That gives me something better," Dickinson said. He began working with a histogram of his image, much like a photo editor corrects a picture in Photoshop. It got him closer to a desired result, but not close enough. Dickinson began thinking about the extensive software-based image-processing component of atomic force microscopy. What would happen if he took a graphene image from his optical microscope and ran it through an AFM processing regimen? It was worth a shot, he thought. "So, I export this optical image into a text file and import it, like sideways, into AFM software and use those techniques," Dickinson said. "Suddenly, I could see a lot here!" He worked to refine the technique. Dickinson said he still wasn't sure about what he had accomplished until he and Schniepp demonstrated the process to Douglas Adamson, a collaborator at the University of Connecticut. "When we showed it to Professor Adamson, he said, 'This is very cool. No one has done this before! It's a useful thing,'" Dickinson recalled. Additional endorsement came at conferences, where their poster attracted a consistently excited group of engineers and scientists. "We were swamped!" Schniepp said. It's no wonder their poster attracted so much attention. Schniepp estimated that their technique is 10 times less expensive and at least 100 times quicker than graphene-inspection techniques now in use. It is a large step toward mass production of the substance and Schniepp gives the majority of the credit to Dickinson. "Most of it was Will's part. I think this paper would not exist without him," Schniepp said. "It's not a situation where I had the idea and then advised him to do that. He was the one who realized the potential that's there and had the patience and persistence to perfect the technique…that's all Will."